Mr Shibu Krishnan is a Consultant Hip Surgeon as well as a Consultant Knee Surgeon working at the BMI Chitern and BMI Shelburne hospitals in Buckinghamshire. He specialises in knee and hip surgery with particular interests in knee arthroscopy, knee cartilage repair, partial knee replacement, total knee replacement, total hip replacement, revision knee replacement, revision hip replacement, minimally invasive surgery, sports injuries of the knee, anterior cruciate ligament reconstruction and trauma surgery. After obtaining his primary medical degree and Master of Science degree in Orthopaedics, Mr. Krishnan carried out a Clinical Research Fellowship at the Royal National Orthopaedic Hospital, Stanmore. During this period, he developed an interest in novel procedures for repairing damaged knee joint cartilage and cartilage implantation techniques. He has published several scientific articles on this topic in major international orthopaedic journals besides presenting them during various national and international scientific meetings. His other areas of research interests include the use of custom jigs for joint replacement surgery. He is also heavily involved with teaching and training, is an Associate member of the Faculty of Surgical Trainers with the Royal College of Surgeons of Edinburgh, and is a reviewer for the Bone and Joint Journal. Mr. Krishnan completed his Higher Surgical Training in Trauma and Orthopaedics on the prestigious North-West London Thames training programme (St. Mary’s –Charing Cross Rotation). He then undertook subspecialty training by doing several reputable fellowships including the Lower Limb Fellowship (Royal National Orthopaedic Hospital), British Orthopaedic Association Transitional Fellowship in hip and knee surgery (Wycombe and Royal National Orthopaedic Hospital), AO Foundation’s Trauma Travelling Fellowship (University Clinic Muenster, Germany) and the Trauma Fellowship at St Mary’s Major Trauma Unit. Mr. Krishnan also obtained formal training in Sports and Exercise Medicine with the University of Bath which led to his Diploma in Sports Medicine. 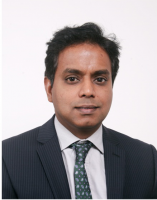 Mr. Krishnan is committed to service development and clinical leadership and has completed a master’s level postgraduate certificate in Innovation and Improving Performance with the Teeside University and a level 7 qualification in Strategic Management and Leadership with the Chartered Management Institute. He is currently the Clinical Governance Lead (Patient Safety) for the Trauma and Orthopaedics department at the Buckinghamshire NHS Trust'. Hip: Mini-invasive Hip Replacement; Revision Hip Replacement; Hip Trauma reconstruction. Knee: Knee Arthroscopy; Knee Cartilage Repair; Meniscal Surgery and Repair; Anterior Cruciate Ligament Reconstruction; Osteotomy; Partial Knee Replacement; Total Knee Replacement; Revision Knee Replacement; Knee Trauma Reconstruction. Associate Editor: International Journal of Orthopaedic Sciences. A review of rapid prototyped surgical guides for patient-specific total knee replacement. J Bone Joint Surg Br. 2012 Nov;94(11):1457-61. doi: 10.1302/0301-620X.94B11.29350. Authors:Shibu Krishnan, Dawood A, Richards R, Henckel J, Hart AJ. Who is the ideal candidate for autologous chondrocyte implantation? J Bone Joint Surg Br. 2006 Jan;88(1):61-4. Authors:Shibu Krishnan, Skinner JA, Bartlett W, Carrington RW, Flanagan AM, Briggs TW, Bentley G.
Collagen-covered autologous chondrocyte implantation for osteochondritis dissecans of the knee: two- to seven-year results. J Bone Joint Surg Br. 2006 Feb;88(2):203-5. Common misconceptions of normal hip joint relations on pelvic radiographs. Arthroscopic removal of loose bodies - a useful technique. Ann R Coll Surg Engl. 2006 Mar;88(2):226-7. Early post-operative femoral component loosening: poor cementing technique? Book Chapter: Peri-prosthetic fractures of the Hip Joint Sep 1, 2016 The Hip Joint: Pan Stanford. Mar 13, 2018 Hip Joint in Adults: Advances and Developments/ Pan Stanford. Evaluation and management of hip pain in adults. Knee soft tissue (sports) injuries- initial assessment and management.